If you live in a small apartment or dorm room, or simply don't want to deal with the hassle of getting a tree, you can channel Christmas spirit in your home without any pine needles. 1. Use string art to draw a tree. All you need is some string and a few nails to make a lovely minimalist tree decoration. 2. Glue together some twigs. 3. Or reuse scrap wood. 4. Black stenciled Christmas trees look great in a spare black-and-white room. 6. 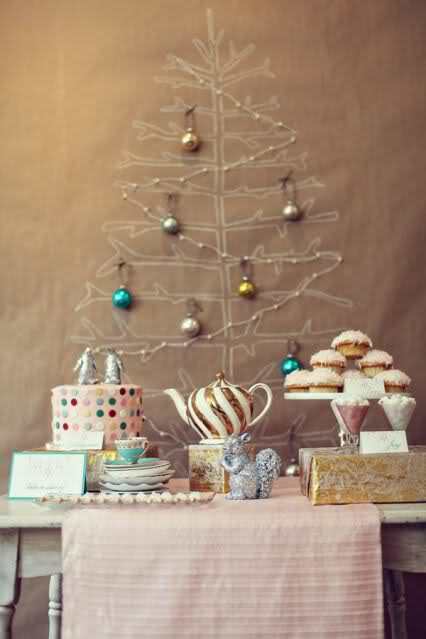 Decorate a small, dried tree with ornaments. 7. For the beer drinkers: Layer bottles to form a very impressive Christmas tree display. 8. Hang ornaments on your house plants. 9. Use washi tape to draw a Christmas tree on the wall. 10. Create a winter forest diorama. Get the complete directions here. 11. Use books to build a tree. 12. Make a felt-shingled tree. 13. Draw a tree on a chalkboard painted wall. 14. Draw a Christmas tree on craft paper or fabric. Hammer in some nails for hanging ornaments. 15. Make a branch ladder tree. 16. Give a money tree as a gift. 17. For a more kitschy decor, hang a bunch of knickknacks in the shape of a tree on the wall. Get the directions for this origami Christmas tree here. Get the directions for this herringbone-form Christmas tree. 19. Create a Christmas-tree garland. This one is made by gluing strips of fabric onto poster board. 20. Create a tree tower using boxes. 21. Put up a tree Advent calendar. The large tree print is from IKEA. Get the full directions here. 22. Create a centerpiece with green paper rolled into trees. Unfortunately, the directions are in French. Wrap the cones in yarn if you don't have the right color paper. These cone trees are made from paper plates. 23. Make trees wrapped in the fabric or wrapping paper of your choosing. Get the tutorial for these poster board cones here. 25. The layers of these trees are made from wire wrapped in ribbon. 26. Hang balloons on the wall in the shape of a tree. 27. Make a light tree. 28. Glue together wine corks to form a tree. 29. Make a family of 3-D gingerbread Christmas trees. Get the recipe and directions here. 30. The simplest tree: Tape paper plates to the wall. 31. Reuse your old newspapers. 32. Create an outline of a tree using a rainbow pom-pom garland. 33. Make a Christmas tree crudité as a table centerpiece. 35. For the gardeners, here's a Christmas tree made from a tomato cage. What a tomato cage looks like. 36. Create a display from Christmas cards. 37. Make a rosette tree using satin fabric. 38. Create a hanging ornament structure that resembles a tree. The full instructions are here and the blogger insists it's not as complicated as it looks!